Lexus LFA and the Lexus GS take a tandem drift through a tight, winding mountain road. And it’s as completely badass. What a glorious way to help get through the week. We were cruising through YouTube and stumbled across a phenomenal little clip of a tandem drift through a tight, winding mountain road. The cars of choice for this little sideways escapade include the mighty Lexus LFA and the Lexus GS. 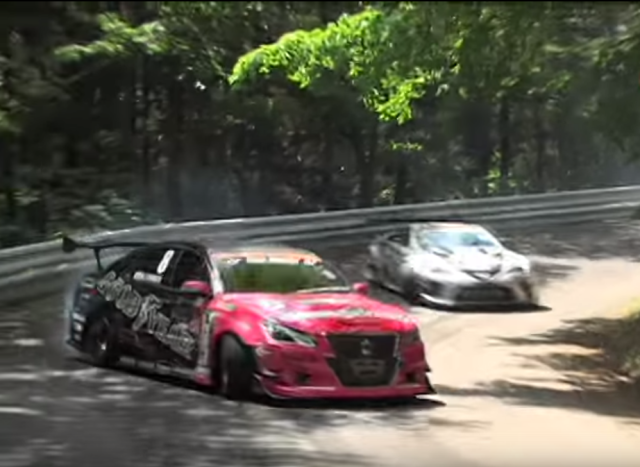 The drivers in this battle are Youichi Imamura and Tokita Masayoshi, and each car is battling furiously to get down the mountain with the best angles and speed. Sadly, the video is only 46-seconds long, but thanks to some very brave filmmakers, the video is full of nothing but great shots and insane noise. As always, when it comes to racing and the sport of drifting, these guys may look like they are tearing up a public road, but this is a sanctioned event. Keep it off the streets and try to stay safe out there, folks. Now press play and watch that LFA chase down the GS in a symphony of noise and tire smoke.